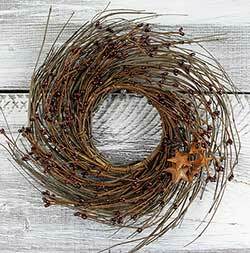 Burgundy Pip Berry & Rusty Star Small Wreath or Candle Ring, by VHC brands. 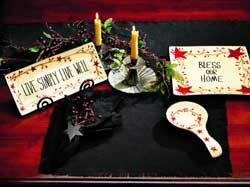 Instant centerpiece for your table, just add a candle and mat! Also nice as a wreath for a small wall space or door. 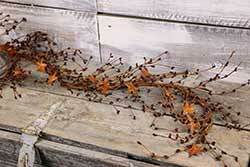 Accented with rusty stars for that country home decor look! Burgundy Berry & Rusty Star Small Wreath or Candle Ring, by VHC brands. 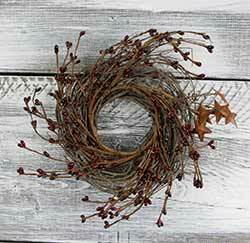 Accent a small wall space or door with this pretty wreath! 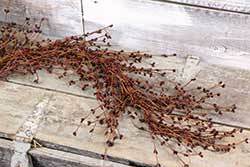 Burgundy Pip Berry & Twig Wreath, by Market Street. 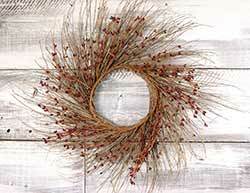 Natural twigs formed into a whispy wreath, accented with resin pips in burgundy red. 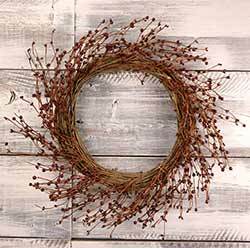 Burgundy Pip Berry Wreath, by Market Street. 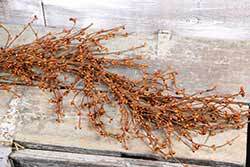 Classic pip berries and twigs for the country home decor look! Hang above a mantel, on your wall, or front door! Versatile and striking and solid black, these placemats are made of a loosely woven cotton fabric to replicate the look of rustic burlap, but with the ability to wash! 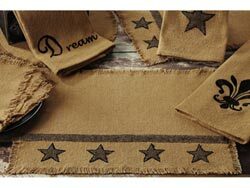 Perfect for a primitive home decor look, the Burlap Black Star Collection features a black cotton burlap fabric with tan stars appliqued along the border. This is for the 63 inch Panels. 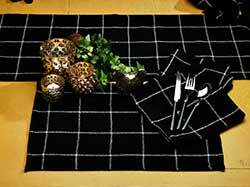 100% cotton burlap in a large check pattern of black and white. 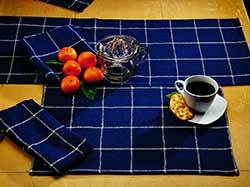 Pretty in dark indigo blue with off-white check stripes, these placemats are made of a loosely woven cotton fabric to replicate the look of rustic burlap, but with the ability to wash! 100% cotton burlap in a large check pattern of indigo blue and white. Burlap Star Hanging Dishtowel, by India Home Fashions. The Burlap Star Collection features an applique star on a soft cotton, naturally colored, loosely woven burlap fabric. This is for the Hanging Dishtowel. Measures 16 x 18 inches. 100% cotton. 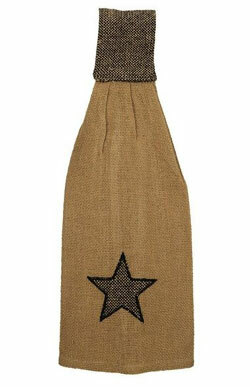 The Burlap Star Collection features an applique star on a soft cotton, naturally colored, loosely woven burlap fabric. This is for the coordinating solid burlap Napkin. The Burlap Star Collection features an applique star on a soft cotton, naturally colored, loosely woven burlap fabric. This is for the Placemat. The Burlap Star Collection features an applique star on a soft cotton, naturally colored, loosely woven burlap fabric. This is for the 36" tablerunner. 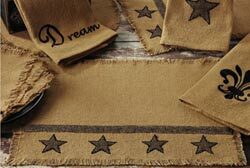 The Burlap Star Collection features an applique star on a soft cotton, naturally colored, loosely woven burlap fabric. This is for the 54 inch table runner. 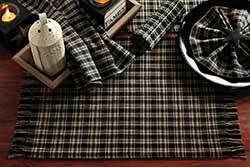 For the classic primitive kitchen decor look and one of our best sellers, the Cambridge 36 inch Table Runner features a plaid of black and tan in a washable woven cotton. 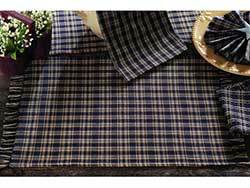 For the classic primitive kitchen decor look and one of our best sellers, the Cambridge 54 inch Table Runner features a plaid of black and tan in a washable woven cotton. 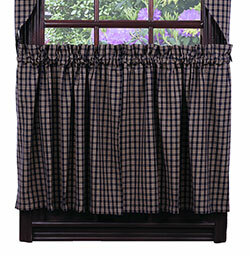 The Cambridge Collection is a classic country primitive plaid, and this is for the Black color (black and tan). This is for the 24 inch Cafe Curtains. 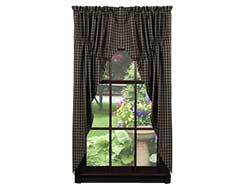 The Cambridge Collection is a classic country primitive plaid, and this is for the Black color (black and tan). This is for the 36 inch Cafe Curtains. Measures 16 x 19 inches, with double ties. 100% cotton. 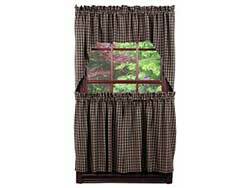 The Cambridge 84 inch Curtain Panels feature a plaid of black and tan in a washable woven cotton. 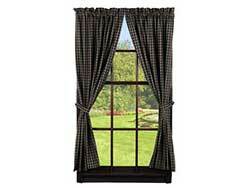 The Cambridge Collection is a classic country primitive plaid, and this is for the Black color (black and tan). This is for the Napkins. Cambridge Black Short Panels, by Olivia's Heartland. The Cambridge Collection is a classic country primitive plaid, and this is for the Black color (black and tan). This is for the Short Panels. 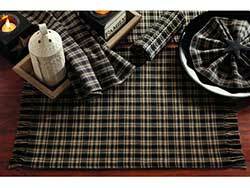 For the classic primitive kitchen decor look and one of our best sellers, the Cambridge Placemat features a plaid of black and tan in a washable woven cotton. 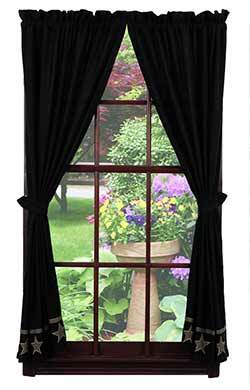 Cambridge Black Valance, by Olivia's Heartland (formerly IHF - India Home Fashions). One of our longest lasting and best selling collection, this valance features a black and tan plaid for a classic primitive home decor look! One of our longest lasting and best selling collection, the Cambridge collection features a classic primitive black and tan plaid. This version has added patches with appliqued black stars and red berries! 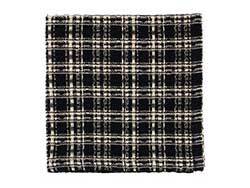 Cambridge Black Plaid Waffle Weave Dish Cloth, by IHF. Great for the country kitchen, also makes a great gift! 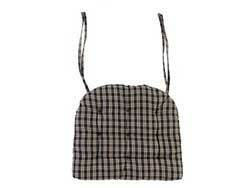 Absorbent cotton in a black plaid. The Cambridge Collection is a classic country primitive plaid, and this is for the Black color (black and tan). This is for the Prairie Curtain. 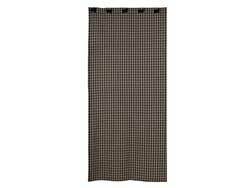 For the classic primitive bathroom decor look and one of our best sellers, the Cambridge Black Shower Curtain features a plaid of black and tan in a washable woven cotton. The Cambridge Collection is a classic country primitive plaid, and this is for the Black color (black and tan). This is for the Swag (upper set in photo). 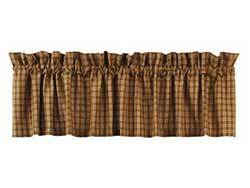 One of our longest lasting and best selling collection, this valance features a mustard and tan plaid for a classic primitive home decor look! Cambridge Navy Valance, by Olivia's Heartland (formerly IHF - India Home Fashions). One of our longest lasting and best selling collection, this valance features a dark navy blue and tan plaid for a classic primitive home decor look! One of our longest lasting and best selling collection, this cafe curtain set features a dark navy blue and tan plaid for a classic primitive home decor look! One of our longest lasting and best selling collection, these napkins feature a dark navy blue and tan plaid for a classic primitive home decor look!